Kakehashi Project and Mazda Foundation Invite 30 Japan Bowl® Students to Japan – The Japan-America Society of Washington, Inc.
WASHINGTON, D.C. – The Japanese Ministry of Foreign Affairs and the Mazda Foundation will once again support the top winners of the Japan Bowl by inviting students to visit Japan. 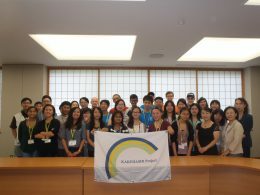 This year, the Ministry’s Kakehashi Project – an initiative meant to encourage young people to interact with Japan – invited 25 students, and the Mazda Foundation will support the five winners of Level 4, the highest level of the National Japan Bowl. The trip, which will be held from July 18th to July 26th, includes a visit to Nagasaki to interact with locals and stay with a host family as well as participate in historic and cultural programs. The students will also attend a cultural program sponsored by the Japan Bowl Supporters Group (JBSG), and will meet with senior government officials and Her Imperial Highness Princess Takamado. They will also participate in a cultural exchange meetup with the Japan National Student Association Trophy Intercollegiate English Oratorical Contest Alumni members. As in years past, the U.S. Embassy’s American Center will hold a reception for the whole group. The 25th National Japan Bowl took place in Washington, D.C. on April 6th and 7th of this year. 170 high school students took part in the competition, with representatives coming from all over the United States and even all the way from Guam. The Japan Bowl tests students’ knowledge of Japanese language and culture, and allows them to form friendships with likeminded students who are also studying Japanese. The Japan Bowl is an academic competition that tests the achievements of high school students throughout the United States who are studying the Japanese language. Beginning in 1992, it grew from a language-only competition to one that asks students about their knowledge of Japanese culture, history, society, sports, behavior, and current events. Since last year, the Japan Bowl has also spread internationally, and competitions have since been held in Poland, Mexico, Serbia, Italy, and the United Kingdom. For more information, please contact Director of Japan Bowl Risa Kamio at rkamio@jaswdc.org.